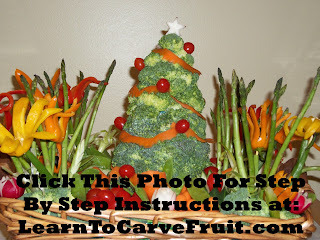 I am re-sharing links to two of my most popular vegetable how-to posts around the holidays, click the pictures below to go to the step by step how-to instructrutions for each project. It is the time of year we all start thinking about getting a little more creative and for most people the holidays are about food and family. 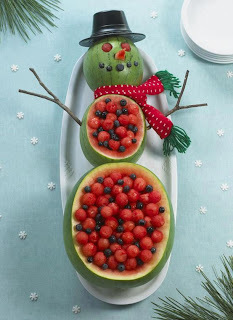 So in that spirit I will be posting fruit carving and food art inspired projects for holiday gatherings all month! So here is my first holiday fruit carving idea which is a simple snowman fruit bowl made out of 3 mini watermelons of varying sizes. Watermelon balls for the eyes, melon wedge for the nose and blueberries for the mouth. Decorate your fruit bowl snowman with the normal snowman accessories like a top hat, a scarf and twig arms!